Leader of the Pack is now only available to Feral Druids, and no longer restores Mana. Mistweaver: Stance of the Spirited Crane now replaces Stance of the Fierce Tiger. Combat Conditioning has been removed. Combo Breaker has been removed. Stance of the Sturdy Ox now also provides the benefits of Brewmaster Training and Desperate Measures. Brewmaster Training has been removed. Desperate Measures has been removed. Stance of the Wise Serpent now also causes Spinning Crane Kick to heal allies instead of dealing damage. Teachings of the Monastery has been removed. Transcendence is no longer available to Mistweaver Monks. Berserker Rage no longer Enrage the Warrior, generates Rage or increases Physical damage dealt. It now functions to break and provide immunity from Fear, Incapacitates, and Sap. Crazed Berserker now includes the functionality of Single-Minded Fury and Titan’s Grip. Single-Minded Fury has been removed. Titan’s Grip has been removed. Devastate now naturally has a 30% chance to reset the cooldown of Shield Slam. Sword and Board has been removed. Enraged Regeneration healing has been increased by 100%, but no longer is increased by being Enraged. Hamstring now costs 10 Rage and deals 20% weapon damage in addition to reducing movement speed, and is only usable in Battle Stance or Gladiator Stance. is now a passive ability that causes Mortal Strike, Bloodthirst, Revenge, and Raging Blow to also reduce the target’s movement speed by 50% for 15 seconds. Mass Spell Reflection now requires Defensive Stance. Meat Cleaver has been removed. Mocking Banner now requires Defensive Stance. Rallying Cry is no longer available to Protection Warriors, and requires Defensive Stance. Revenge now requires Defensive Stance or Gladiator Stance. Safeguard now requires Defensive Stance. Shield Slam now requires Defensive Stance or Gladiator Stance. Spell Reflection now requires Defensive Stance. Taunt now requires Defensive Stance. Thunder Clap now costs 30 Rage, and also reduces the movement speed of nearby enemies by 50% for 6 seconds. Requires Defensive Stance or Gladiator Stance and is no longer available to Fury Warriors. Vigilance now requires Defensive Stance. Warrior Stances once again have their own action bars. Whirlwind now requires Battle Stance and is available only to Fury and Arms Warriors. Wild Strike now costs no resources to use with a global cooldown of 1 second, but is not usable normally. Bloodthirst hits have a 20% chance of making Wild Strike usable with 3 charges. Moonkin Form now grants increased Mastery instead of 5% to Spell Haste. Survival Instincts no longer requires or forces the Druid into Cat or Bear Form, and is now available to all Druid specializations. Survival Instincts now reduces damage taken by 70% (up from 50%) with a 2-minute cooldown (down from 3 minutes), and can have up to 2 charges (up from 1 charge). Stance of the Sturdy Ox and Stance of the Fierce Tiger now reduce the global cooldown of the Monk’s abilities by 0.5 seconds. Stance of the Wise Serpent now causes Haste to reduce global cooldown of the Monk’s abilities. Focus and Harmony is a new passive ability for Mistweaver Monks and causes Haste effects to reduce the global cooldown of spells and abilities. Eminence now causes a nearby target to be healed for 35% of all damage caused by the Monk and includes auto attacks. The Monk's Attack Power is equal to 100% of their Spell Power, and they no longer benefit from other sources of Attack Power. The Monk gains Eminence, causing all damage dealt to also heal nearby allies. Haste reduces the global cooldown of the Monk’s abilities. Muscle Memory, Serpent's Zeal, and Vital Mists have been replaced with a new passive ability, Crane Style Techniques. Crane Style Techniques enhances several of the Monk's combat abilities while in Crane Stance. The Windwalker passive ability, Combat Conditioning, Stance of the Fierce Tiger now causes Rising Sun Kick to cause Mortal Wounds, instead of it causing Mortal Wounds naturally. Developer's Note: Arms is still undergoing heavy revision and additional information will be made available later. Battle Stance for Arms Warriors now generates increased 100% Rage from auto-attacks and Critical Strikes now generate double Rage. Mastery: Strikes of Opportunity has been removed, and replaced with a new ability, Mastery: Weapons Master. Mastery: Weapons Master increases the damage of Colossus Smash, Slam, Mortal Strike, and Execute abilities by 20% (increasing with Mastery). Blood and Thunder has been removed. Deep Wounds is now available only to Protection Warriors, and naturally triggers from Thunder Clap. Thunder Clap is now available only to Protection Warriors, and its damage has been increased by 50%. Executioner is a new passive ability for Arms Warriors. Executioner causes the Warrior's auto attack hits to generate an additional 40 Rage against targets with less than 20% health remaining. Additionally, the Execute ability no longer requires the target to be below 20% health to use, but its Rage cost is increased by 100%. Colossus Smash now costs 30 Rage, deals 225% increased damage, and no longer increases the damage of Slam. Enrage is no longer available to Arms Warriors. Execute for Arms Warriors now costs 20 Rage, and consumes up to 40 additional Rage to deal additional damage. Mortal Strike now costs 30 Rage (instead of generating 10 Rage). generates 20 Rage (up from 10 Rage). Slam has been removed. now costs 15 Rage (down from 25 Rage) and no longer has additional effects when Sweeping Strikes is active. Whirlwind is now available to Arms Warriors. Drops by 0.04%/sec per level past 90. Is the radius of lava lash's flame shock spread centered on the shaman or on the target that's being lava lashed with flame shock on it? Centered on the target that's being Lava Lashed. -Say I have 0 stacks of SoB, and am about to begin AoEing. My main target has BP/FF at 20s, while another nearby target has them at 28 seconds. Pestilence, in this case, will take the 28 second DoTs and apply them to everything? Still a bit murky about how 0 stack SoB works with NP, since on Alpha it starts by spreading at 1 stack/30s and then adds stacks after- is this all intended? -Now say I have 2 stacks of SoB- instead of looking for a target with longer diseases, Pestilence will automatically refresh BP/FF on all nearby targets or spread them at full duration. In addition, it will add one stack to existing Necrotic Plague infections OR spread 1 stack/30 second Necrotic Plague to any targets without the disease. I was referring to Scent of Blood, the passive, not the stacks. The SoB passive is what says the "your Pestilence refreshes your diseases" effect. Vereesa (Verestrasz) has noticed that Pestilence for Unholy/Frost DKs seems to be spreading diseases at current durations instead of spreading them at new durations- is this intended, or a bug? If it's intended, could you elaborate on Pestilence's functionality for both DPS specs- assuming BP/FF and Necrotic Plague? Also, will Pestilence behave better with big boss models and adds from now on? Thinking ones like Ragnaros, Al'Akir and Immerseus here. Yes, intended. That's why I said it *clones* the diseases to the other targets. Pestilence hits all units who have any part of their hit box within 10yd of you. Yep, Shining Protector was bugged, still using the old 2x (X/2)% style. Fixed, for the build after next. Does the cloned dot include the current ongoing time-to-tick on the new target? What is the spirit regen formula/scaling at level 100? It's 0.412207024 Mana per second, per Spirit. What's the mana regen rate of arcane mages now that the 90 tier is decoupled from mana? (1+Haste)*1.8% of base max mana per second. EDIT: Fixed. Originally said 0.4%, but forgot that Mages have a hidden passive which gives them 4.5x. Can multistrike melee hits proc "on melee hit" procs like killing machine and sudden doom? No. Multistrikes cannot proc other things, unless those other things specifically call out that they proc from Multistrikes. How will Blood in the Water (feral execute, rip refresh on FB) work with the panedmic mechanic. Will it grant a longer 130% duration Rip, or will it always reset to the base duration like it does now? Fixed Blood in the Water and Touch of Chaos to be able to refresh up to 1.3x base duration. That'll be in the build after next. Reminder for anyone working on Recount, Skada, etc... Filter out damage done to Prismatic Crystal. The Mage will cast an additional spell that does damage to enemies based on damage they deal to Prismatic Crystal, so if you include both, you'll be double-counting them. Please confirm this. 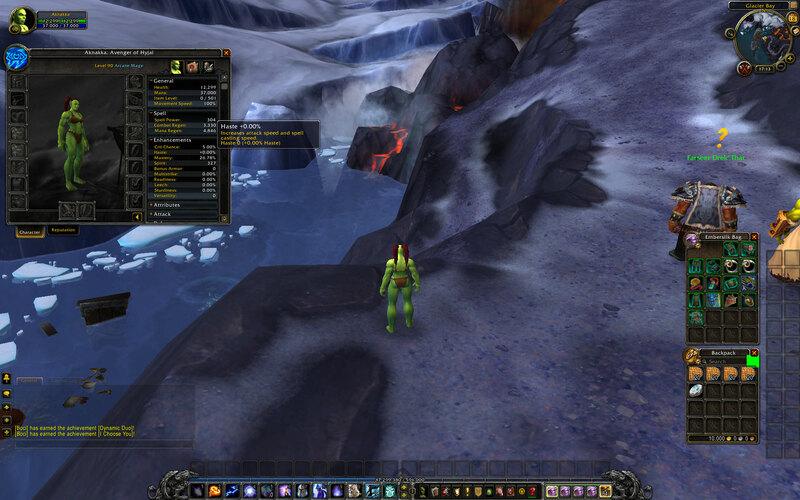 My current level 92 fire mage on alpha has 1.8% mana per second, which is almost an order of magnitude higher. My template 90 arcane mage also has much higher mana regen than this quoted number. EDIT: 3330 combat regen mp5 according to tooltip on naked template 90 orc arcane mage. Mana pool is 37000, which gives 1.8% mana per second. Is the quoted mana regen implemented yet? 3330 mp5 over 37000 mana pool, 3330/5 = 666, 666/37000 = 1.8%. This does not agree with quoted 0.4% figure. Whoops. There's a passive that gives them 4.5x Mana regen, but I forgot that it's hidden, you don't see it. Yes, it's 1.8%, not 0.4%. Fixed the post above. Thanks. Does this mana regen rate decay from level 90 to 100? #2 and #3 are currently not working. Sweeping strikes never multistrike, and multistrikes are not added to the ignite. Yep, I fixed those late last week; check next build. What is the mechanical philosophy behind Eminence and Atonement? It varies. All stats benefit healing, but it's alright if only some stats benefit Atonement/Eminence, or only competitively benefit Atonement/Eminence. But lets keep this thread about theorycrafting, and leave the "why" and philosophy for other threads. Feel free to state what the values of each stat are (based on theorycraft) are to Atonement/Eminence though here, that's good data. noticed that if Blood Craze is procced on consecutive autoattacks, it seems to become an ignite? It looked like it was adding the leftover dot into the next 3 ticks. Does that sound right? Why do tanks need vengeance/resolve? Can't you just get rid of it? is sunfire + astral showers getting a graphical update to reflect it's aoe effect? Can't post on us forum. What's the shooting stars chance for multiple moonfires? Still: base_chance * sqrt(x)/x ? Still 2.5% chance to proc? Seems farily low compared to 30% chance on crit live version. Do you have any plans of capping the amount you can extend MF/SF with Balance of Power like the old Starfire glyph? These Q's confuse me. Lots of boomkin chatter but I can probably count the # of boomies I've seen in randoms on my fingers. WTH? Possible to add a combatlog entry with the name of who Misdirection was cast on? Impossible to track with WeakAuras and others. Can we talk less about pets and more about why Bear Trap is such a terrible idea for a 2 minute cooldown? carrion swarm & supernova both could be used as an interrupt, yet the former is something you dont want warlocks to have, why? And on the back end of that, why not for arcane either, shouldn't arcane multis gain dmg from mastery and/or arcane charges? Are frosts frostbolt multistrikes supposed to proc the icicles? If so why do they work for ignite but not frost. Could you explain what the Supernova is supposed to do exactly? The knock-up looks tiny and doesn't seem to serve much purpose. Not a bad idea though its going to need a pretty sizable shot in the arm to be useful. Thanks for the reply. Nether Tempest appears to snapshot arcane charges, but update with mana and SP changes, tooltip confirms, intended? Will monk's +20% Blackout Kick perk work with Chi Explosion? Versatility: Will fistweaving double dip? How will it work for heals based on damage? Cant you make the talent gives the effects of Readiness without it being a stat? Should Devouring Plague's duration decrease with Haste? Bonus orb talents and more DPs vs. smaller MF:I window. I thought haste wasn't going to be reducing dot durations, only moding the period? That not a thing? so its a nice nerf to shadow. Another one. Currently, Death from Above sometimes only works when you're 10y away or so. Isn't it supposed to be used while in melee? Aye my bad. There's something to fix though, so I guess uploading the clip wasn't so useless after all. Thanks anyway. Sudden Death: will it proc from white only going forward, or is there a chance for Multistrike to replace SoO's contribution? Any thought what might replace Anger Management talent for warriors since Readiness isn't going to be put in the game? will the proc chance of WoD RPPM trinkets scale with haste? Or case by case basis? is there an example spell that does call out for "on multistrike hit" you can give me? Thanks for the quick replies. Does that mean 66 ms rating will give two 1% chances to do an additional 30% dmg? And 80 haste rating = 1% haste? is armor mitigation going to be 75% or 85% in 6.0? so using armor/armor+k_value means we'll see 29650 being the 85% cap? Arent you afraid, that ne new sec. Stats will have a huge Impact in PvP? Even if these Stats are low? If not, why? Ah ok, you seems to be very relaxed. Why are you bringing these Stats in the Game, if you know, these can be "bad" for PvP? For sure! But doesent some Speccs sacle more with these stats than other? I think of "bursty" classes, which benefit too much. I bet it's not tuned yet. per post on spell damage tuning. GC's Law: In social games, players fear the perception that they are uninformed more than the perception that they play badly. We will see win rates increase when we change recommended items. We see high ban rates for champions with low win rates, we assume because the pros are doing it. This legit confuses the crap out of me. What makes people think the meta is the same at every skill level? Gazlowe shows up in Heroes of the Storm, but he is also involved in the Warlords of Draenor garrison quests. Blizzard posted a nice behind the scenes video of the voice acting recently.